I almost pulled an ‘Eve’ on my husband. Standing in front of a cage at Sarge’s Animal Rescue, Mike held Jason, the kitten he had previewed earlier in the week. 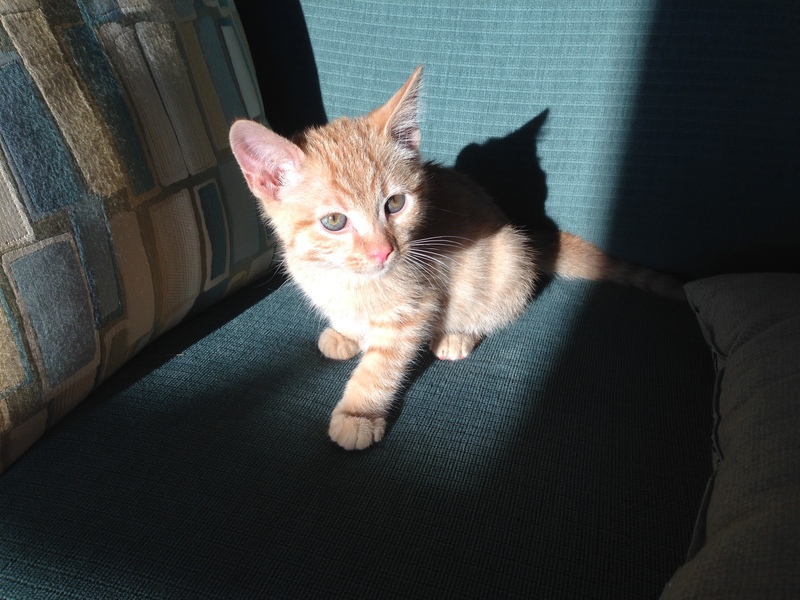 This orange tabby had been brought in with his litter brother a few weeks earlier. We had made the rational decision to seek just one kitten to bring home to lonely Luther. In the space of 3 months, Luther had lost Leia, our feline matriarch AND Calvin, his brother from whom he had not been apart in 8 1/2 years. We’ve had the pattern of adopting cats in pairs, but had arrived at the conclusion that we should bring home only one kitty this time. Money considerations as well as a fear of overwhelming poor Luther were good reasons. Now maybe a husband who just wants to please his wife sounds ideal to some women. But it’s wrong if it’s used as an across-the-board principle. What SCARES me is that I came really close to letting an emotional reaction arbitrate and replace a rational decision we had made together. What ALSO is frightening is the degree of power we wives have available to us, vis à vis our husbands. Women know how to play on a husband’s antipathy to standing up to possible emotional pressure from us. They call it, ‘pleasing their wives‘. Of course men are to be considerate and love their wives, but that doesn’t mean ALWAYS giving in. Men are called to be wise but firm leaders. And that can be painful as men have to weather female drama. “Without a doubt,” came the reply, “kittens go quickly.” And with a sigh of relief, I felt affirmed in sticking to our original decision. I pray that next time, if I am tempted to push Mike in a similar situation, I’ll flee before I even flirt with that apple, no matter how tasty it looks. I am young, but I can relate. I understand, from a marriage point of view, but as a younger man I do appreciate a woman taking charge. Were I married? I would be oh-so-willing to accept “what is the degree of power wives (women generally) have available to us, vis à vis our husbands. Women know how to play on a husband’s antipathy” and I welcome such a woman. Just my point of view. Thanks for listening. Nowhere do I find, however, that a woman can not, at least for a time and with mutual agreement, dominate a man. I too agree there must be mutual agreement and understanding, and I also have experienced that woman, more often than not, have the cooler and more logical mind. Yes, I do see your point and can accept your point as it applies to your life and marriage. In fact, I admire your willingness to defend your position openly. it builds within me a deep respect for you as a woman in love with her man. No greater reward may be given a man than such as you present him this day. for this, I commend you. yet, for a time to come, I want to remain (somewhat) submissive and unto my own understanding of what it means as mutually acceptable. I do want to thank you for your taking of time in order to respond to me. It is, as always, appreciated. Wish I had time to reply to this. I have a different problem! James – you are an unusual man…or just an honest one. As an ‘older’ sister in Christ …I would gently warn you that women want to be listened to, but they don’t respect men who don’t step up to the plate. A husband who loves his wife with a sacrificial, giving love like Jesus AND firmly leads the family is one a wife can’t help but admire and respect. I suppose I am a blend of both. Unusual and forthright. I find no apparent fault in that though. Yes, I can fully agree on what woman desire from a good and Christian man. I in no way impart from being a good listener, a sacrificial lover and friend to one of whom I may one day wed.
Those days, I have a feeling, are still off in the distance…. as I am, and remain, single and virgin (by todays measurements this too is unusual). Smiles! I thank you for again taking your time in order to answering my (unusual ranting). Lol!